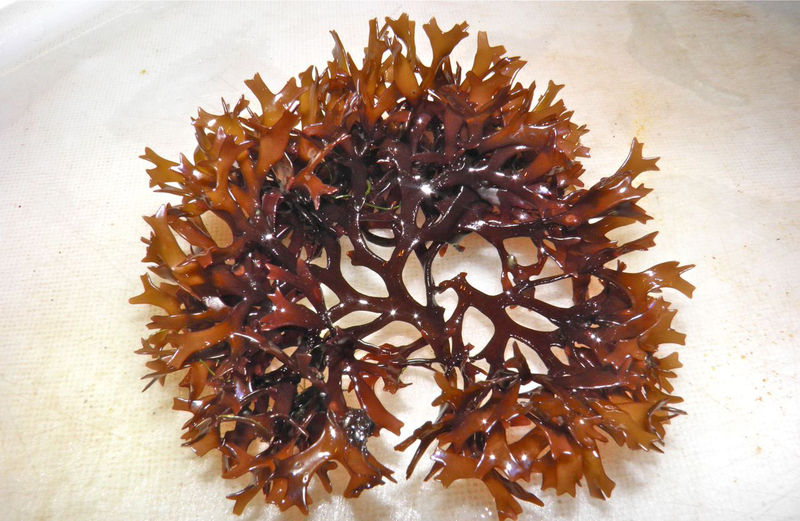 Irish moss, also called Carrageen moss, Carragheen, Carrageen, is red algae in the order Gigartinales which are found on rocks, pools, lower intertidal, shallow subtidal. 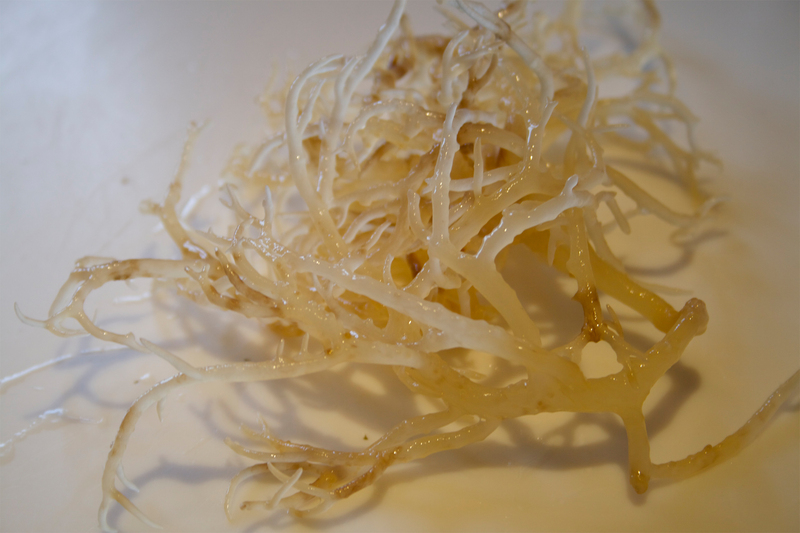 The fronds of Irish moss are fan shape which is 150 mm high, 2-15 mm broad and 2 or 3-10 or 12 inches long. 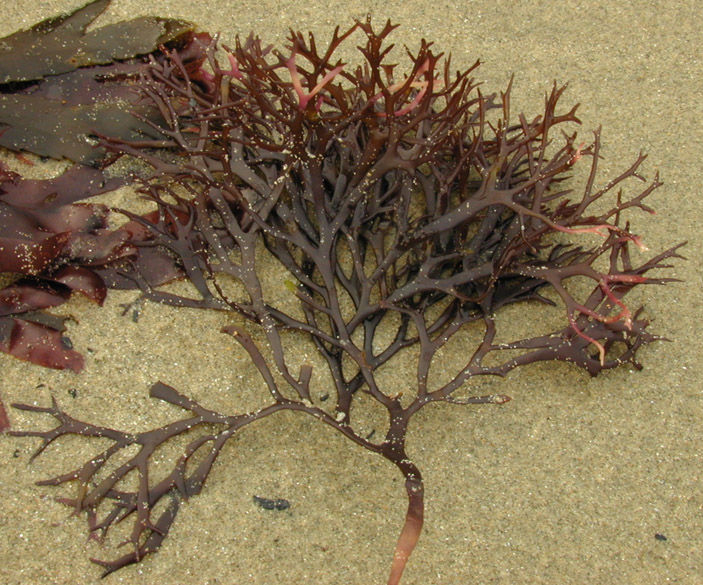 The frond is cartilaginous, dark purplish, red, yellowish or greenish in color. 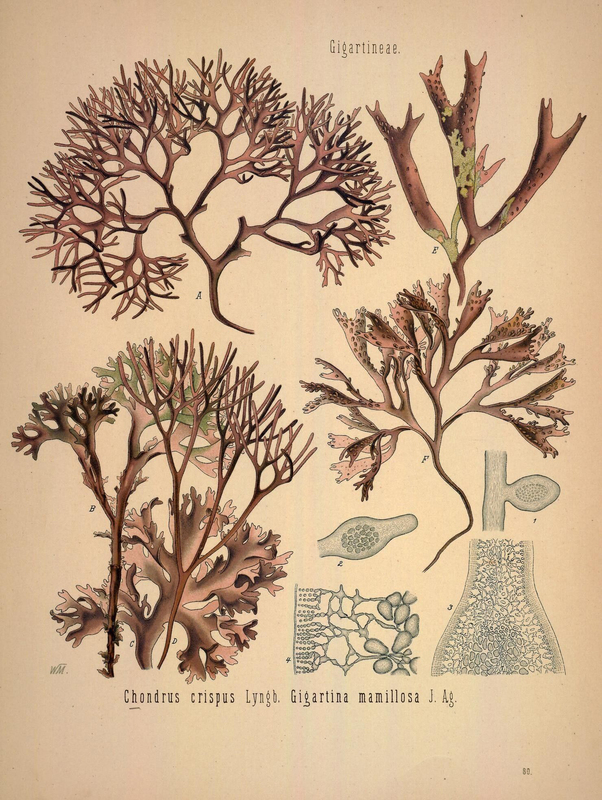 The branches of Irish moss are 2-15 mm broad and four or five times in a dichotomous. It possesses a compressed, narrow and flat stipe with rounded, apices blunt or subacute axils. 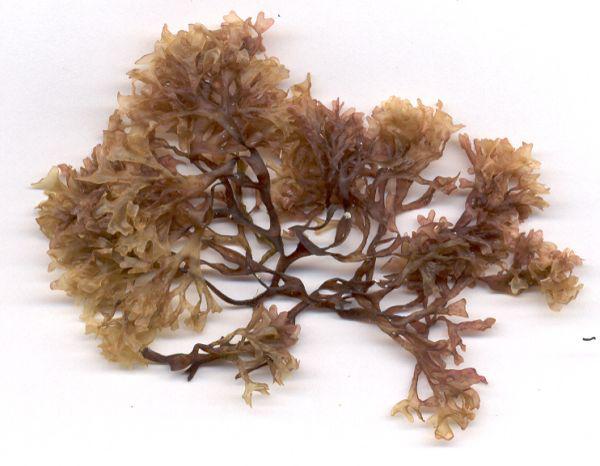 During the famine of 19th century, Irish Moss was incredibly used in Irish. In past, it was used as cattle feed, as a mattress stuffing and thickener for colored inks that is used in printing. According to the ancient Irish folklore, people used to carry it on the trips for protection as well as safety. It was also used to treat pneumonia and tuberculosis. 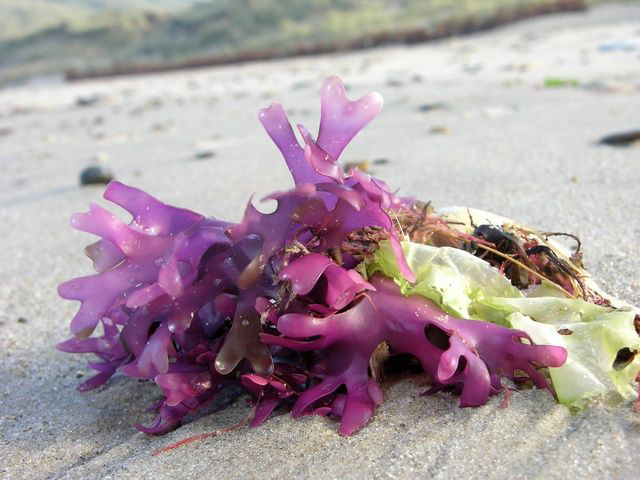 Traditionally Irish moss was used in the leather curing, soap industry, paper marbling, calico printing and to manufacture linen and paper and to provide soft finish to the material. They are also used in various toothpaste, lotions, creams and foodstuffs. 2 tbsp (1/8) cup of 10 gram provides about 5 calories. It consists 0.02 grams of fat, 0.1 grams of dietary fiber and 0.06 grams of total sugars. 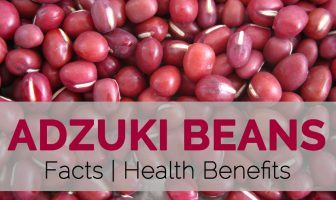 It provides 11.13% of iron, 4.50% of Vitamin B9, 3.62% of Vitamin B2 and 3.33% of Magnesium. 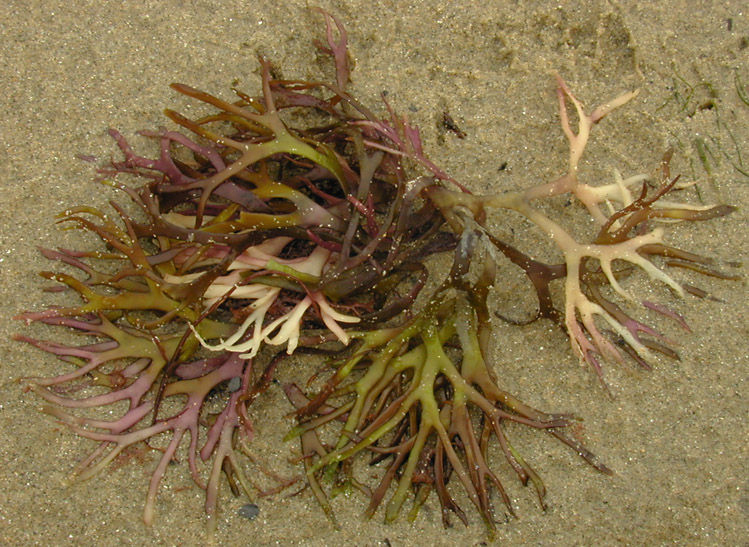 Irish moss possesses 15 essential elements that create human body such as calcium, sulphur, iodine and potassium along with Vitamins A, E, D, F and K. So it is considered as the seaweed which helps to cure bladder disorders, halitosis, bronchitis, intestinal disorders, glandular problems, swollen joints, thyroid conditions, lung difficulties, tumors, tuberculosis and ulcers. The studies shows that Irish moss possess anti-viral properties which help to counteract with mumps viruses and Influenza B. Anemia is the result of low presence of hemoglobin and red blood cells in the body because low amount of oxygen in transported in the body. Anemia results to low level of energy and also affects the body parts such as low immunity and poor brain function. WHO has evaluated that about half of the anemia cases in the world is caused due to the deficiency of iron. Iron assists to transport oxygen to the cells. It also assists the metabolic enzyme process that is essential to absorb nutrients and digest proteins from the food. Due to this iron deficiency leads to the exhaustion, sluggish symptoms and problem in being active. The deficiency results to mood changes, low concentration and problem in the muscle coordination. Iron is required for the movement of muscles as it assist in the oxygen storage in the muscles that helps to strengthen and movement. Iron is essential to support the functions of brain as it supplies oxygen to the brain. About 20% of the oxygen is used by the brain. The deficiency of iron leads to mental or memory problems. In the children and infants, the iron deficiency can result to cognitive abnormalities and psychomotor as well as problem in learning. The deficiency of iron delays in the motor function which helps to connect thoughts, movement, activities, processing and learning new information. During pregnancy, iron deficiency increases the chances of premature birth and underweight newborn. Premature born suffers from various health problems such as cognitive development and delay growth. So it is advised to consume adequate amount of iron rich foods. The study shows that the women with high intake of iron supplements lower the chances of low weight of new born by 8.4 percent. Iron is required for the absorption of nutrients and digestion as it plays a vital role in the process of metabolic enzymes. Additionally, iron transports oxygen to the damaged areas such as damaged organs, tissues and cells which have the high chances of developing disease or infection. Neurotransmitter functions depend on the adequate amount of iron in the blood that assist to maintain the positive mood. The mood also depends on the hormone balance such as dopamine, serotonin and other hormones that cannot be properly synthesized in brain due to low presence of oxygen levels. Due to this it results bad sleep, poor mood, low level of energy as well as motivation problem. The deficiency of iron also results in the restless leg syndrome that leads to sleep problems. Iron assists to supply oxygen up to the muscles that lowers the muscle pain and spasms. 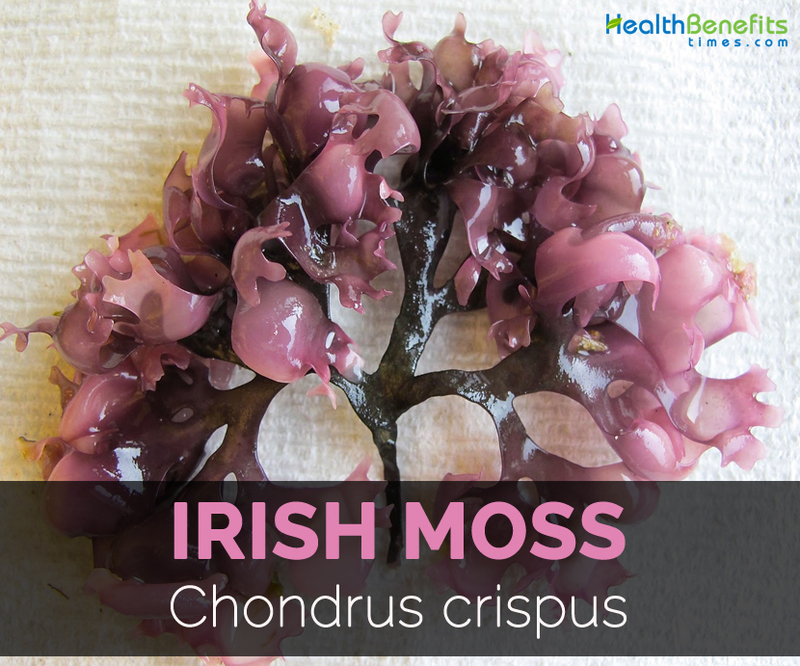 Irish Moss was used in the medical applications which dates back to 1830s. It is still used in medicinal teas, cough medicines, encounter bronchitis, colds and chronic coughs. In Venezuela, Scotland and Ireland, Irish moss is boiled with milk and added honey to treat chest congestions and sore throats. In Jamaica, Trinidad, Tobago, it is believed to possess an aphrodisiac property so it is boiled with milk, cinnamon in order to make a thick drink. 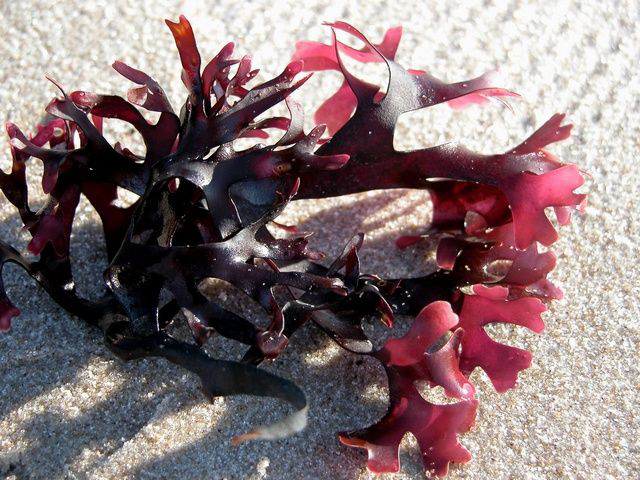 Irish Moss is used as a stabilizer and suspension agent in medicinal creams and lotions. It is used to treat pulmonary complaints such as chronic diarrhea, scrofula, enlarged mesenteric glands, dysentery, rickets, kidneys and bladder irritation. 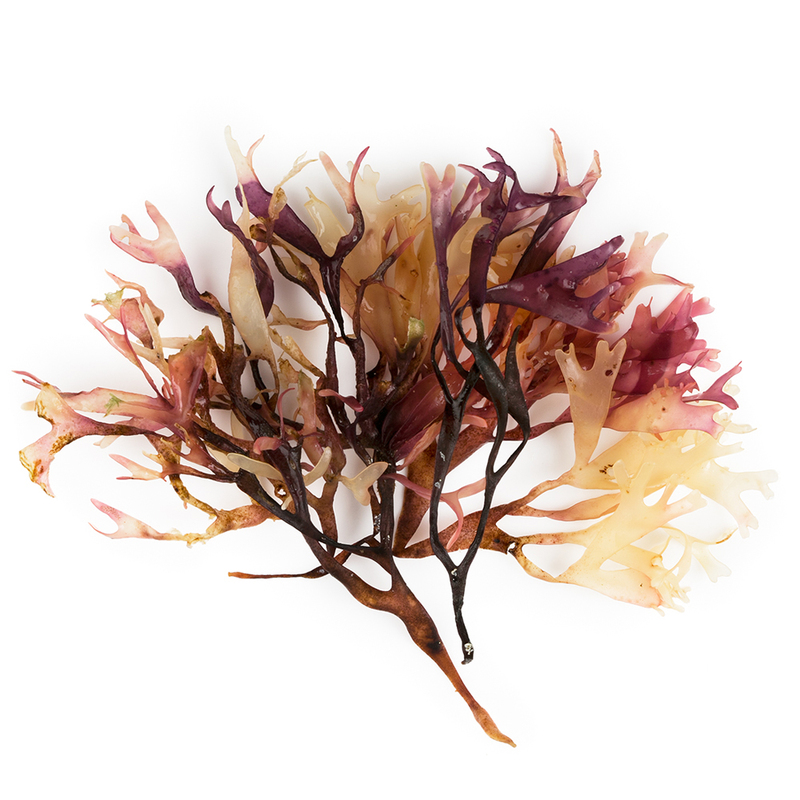 Irish Moss is used to soothe and nourish skin. Irish Moss is traditionally given as a nourishing food for invalids and is still used to boost the body when recovering from a serious illness, due to its high content of important nutrients (it said to contain 15 of the 18 elements composing the human body). It is used to treat bronchitis, thyroid problems, goiter, to tone as well as strengthen glands. It is believed to provide from duodenal and peptic ulcers without any side effects on colon. Traditionally Irish Moss helps to treat respiratory illness such as bronchitis, irritating coughs and many other. It may be used to treat digestive ailments such as gastritis, stomach ulcers and duodenum. The Irish moss tea assists indigestion, ulcers and gastritis. It also eases inflammation in urinary system. It may create mild irritation to the eyes. 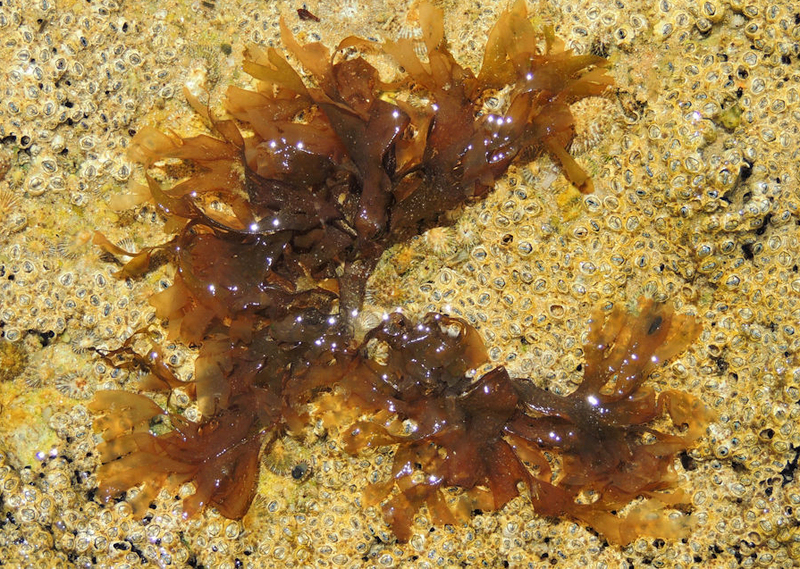 Irish moss possess the blood thinning properties, so it should be not be used by the people with bleeding disorder. The people with thyroid ailments should also avoid because it contains high amount of iodine content. The pregnant or breastfeeding women, child or having medical conditions should consult physician before use. 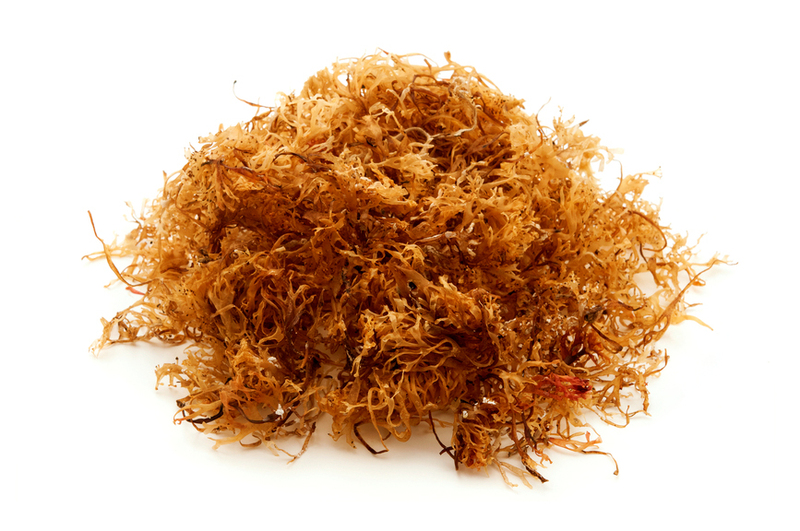 Irish moss should not be used more than two. 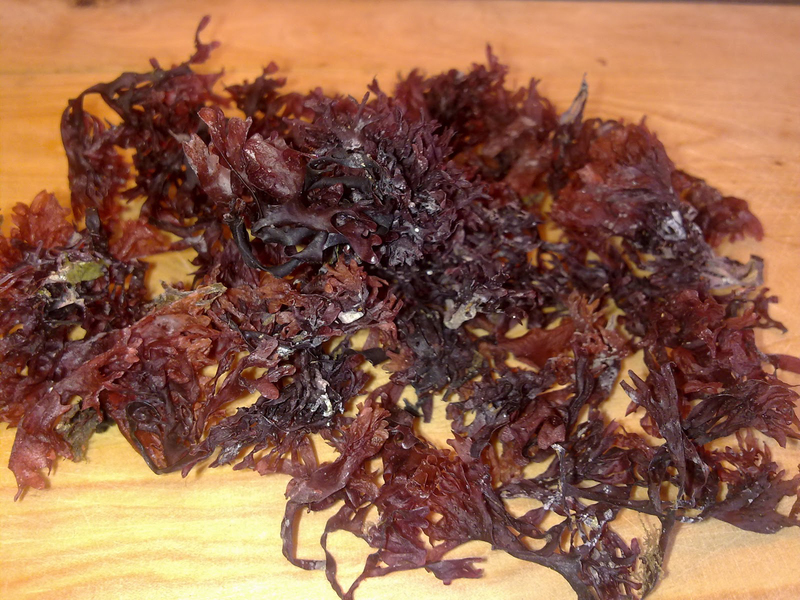 Irish moss is a perfect alternative of gelatin which acts as a gelling agent in stews, soups, gravies as well as salad dressings. One cup of Irish Moss should be added to three cups of water or milk and add sugar and cinnamon for flavor. It is also used as a stabilizer for dairy products such as sherbets, ice creams, yogurt, chocolate milk and whipped cream.